Back in the dying embers of 1977 when Yours Truly KJS first found the Electric Light Orchestra (ELO) as a ten year old, starting with the purchase of "Turn To Stone" b/w "Mister Kingdom" (Jet/UA #UP36313), it was quite natural to go backwards in time and rummage through either the Oldies Unlimited catalogue (remember that?) 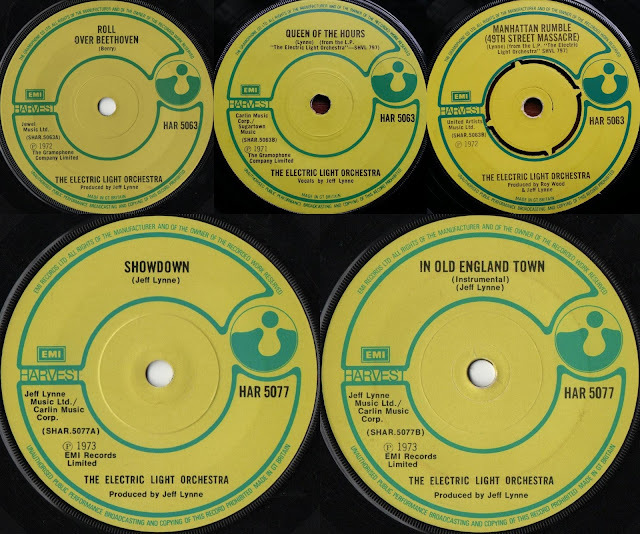 or various second hand record shops in Wolverhampton and Birmingham to collect the ELO back catalogue including (of course) their Harvest hit singles "10538 Overture" (#HAR5053), "Roll Over Beethoven" b/w "First Movement (Jumping Biz)" (#HAR5063) - especially with original 'B' side "Manhattan Rumble (49th Street Massacre)" withdrawn in favour of the more widely available "Queen Of The Hours" - and "Showdown" b/w "In Old England Town (Instrumental)" (#HAR5077). Back then you noticed just how many compilation albums were about that covered the Harvest career of early ELO which cut and pasted their first two studio albums "The Electric Light Orchestra" (#SHVL797) - also known, amusingly, as "No Answer" in the States - and "ELO II" or "ELO2"(#SHVL806) together with the then non-album UK single "Showdown" including the 1974 collection not unsurprisingly entitled "Showdown" (#SHSP4037). 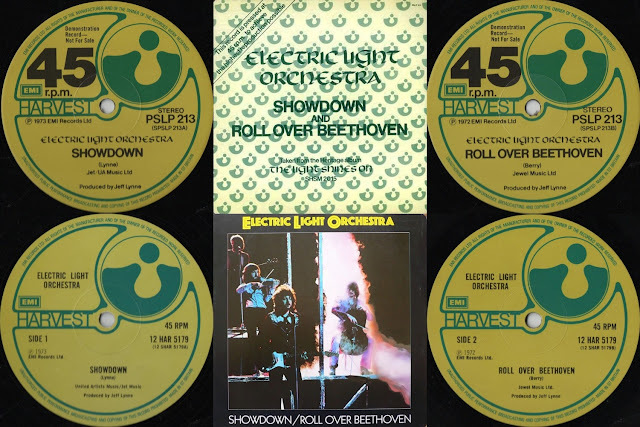 1977 also saw the release of the Harvest Heritage LP "The Light Shines On" (#SHSM2015) which saw the first reissue of the single "Showdown" backed by "Roll Over Beethoven" (#HAR5121) on 7" together with a limited edition demo also issued on 12" (#PSLP213) doubtless hoping to build on the success of "A New World Record" (Jet/UA #UAG30017) and the newly unveiled "Out Of The Blue" (Jet/UA #UAR100). Two years later in 1979, with ELO at their commercial peak following their 1978 spaceship festooned world tour, the multi-platinum selling "Out Of The Blue" (with its four hit singles) and ELO's first #1 UK album "Discovery" (with four Top 10 singles following in its wake), Harvest Heritage put out "The Light Shines On Vol. 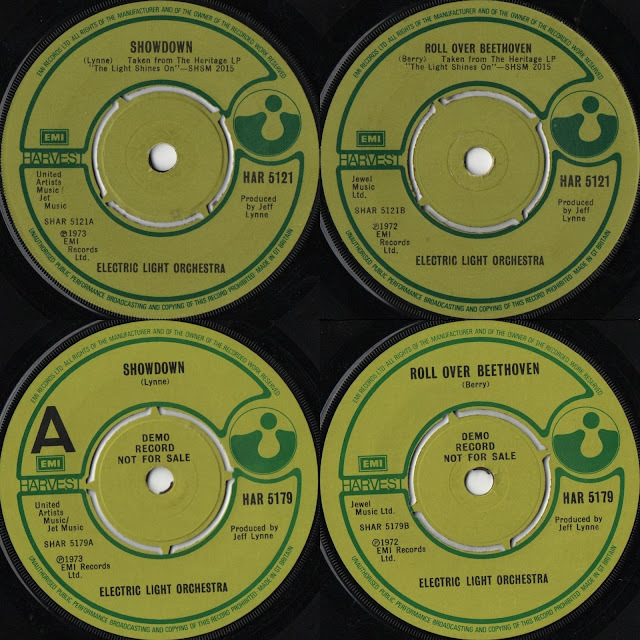 2" (#SHSM2027) - another trawl through ELO's first duo of Harvest albums with a second reissue of "Showdown" b/w "Roll Over Beethoven" (#HAR5179) this time with a rather attractive full 12" pressing too (#12HAR5179) including the eight minute album version of the Chuck Berry penned classic. This was a time of discovery - literally - for this writer as it also led to an appreciation also of the role of Roy Wood not only in the invention and foundation of ELO but also his amazing songwriting, musicianship and production for himself, The Move, Wizzard and beyond. If nothing else, the very many reissues and compilations issued by EMI/Harvest over the years covering the first light years of ELO cement the core trio of Jeff Lynne, Roy Wood and Bev Bevan in rock music folklore. And hidden in the background, somewhat underlining that early ELO promise, has been those aforementioned thrice released singles "Showdown" and "Roll Over Beethoven".